They’ve done some very silly things in the name of free speech. If a movement can be undone by diapers, was it ever really a movement at all? Turning Point USA is a conservative organization meant to offer opposition to the wealth of left-wing campus activism in the age of Trump. Founded and fronted by Charlie Kirk, an expert in riling up his fellow conservatives in the pseudo-intellectual style of Ben Shapiro, TPUSA has been a catastrophic failure. Instead of making universities a “safe space” for conservatives, the group has landed themselves in the news time and again with one embarrassing gaffe after another. Recent rifts in the organization have led to speculation that TPUSA may not be long for this world. This hasn’t stopped the organization from receiving funds from well-connected but out of touch conservative donors who are prepared to keep the project afloat regardless of the embarrassment it causes its member and the name of campus conservatism in general. The non-profit pulls in millions of dollars a year, though it is unclear exactly what those dollars are accomplishing. Though TPUSA hasn’t created a groundswell of conservative energy as it might have hoped, the organization has been entertaining, offering Twitter one thing to mock after another. Most of what Turning Point USA gets up to feels like harmless attempts to translate their terrible conservative memes to the real world. The resulting half-assed attempts at fascist performance art are generally only harmful to the reputation of their participants. But some of their terrible plans could actually have far-reaching consequences if they ever worked. In May of last year, The Chronicle of Higher Education reported that TPUSA was funneling thousands of dollars into a scheme to functionally buy student elections. This behavior was uncovered at a number of universities, including University of Maryland and Ohio State. The rigging attempts were conducted so clumsily that a leader of OSU’s TPUSA chapter was caught on tape admitting to the scheme. This was actually a pretty devious way to astroturf conservative values onto college campuses. If only they were smarter about it. Last summer, a video team from TPUSA went to a Chicago Socialism Conference and attempted to own leftists with capitalist logic. The host used lines like “You have some nice Nikes on!” and “You like those good capitalist french fries?” Using Nike as an argument for why capitalism works is already a difficult proposition, but the host doesn’t provide much in terms of an argument. While this demonstration wasn’t painfully embarrassing like many of TPUSA’s antics, it is a head-scratcher, and lame as hell. The UC San Diego chapter of TPUSA held an event with a “free speech ball.” The ball was a large novelty beach ball that students were encouraged to write (presumably politically incorrect) messages on. Thankfully, a student, who TPUSA claims is a communist, came along and popped the ball with a pocket knife, saving the unwitting TPUSA members from their own tragic lameness. TPUSA members responded to the incident in the way all cool college kids do: by calling campus police. But it’s an idea that’s spread across campuses. Turning Point’s biggest misfire and greatest moment of accidental comedy happened last fall. 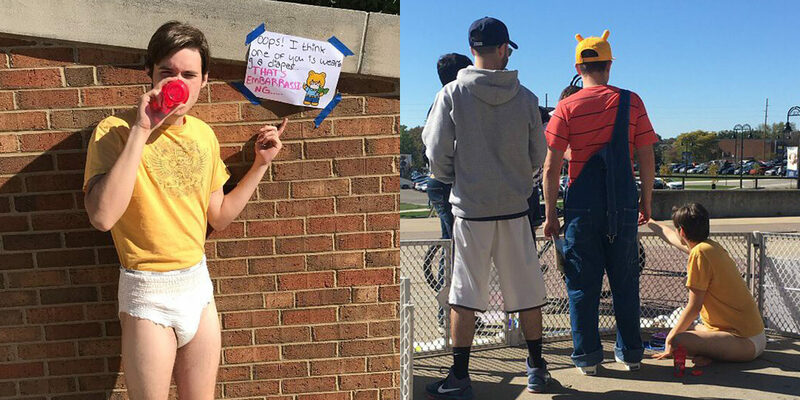 It’s hard to imagine this idea got past first draft stage, but Kent State TPUSA members decided that the best way to protest the perceived liberal need for safe spaces was to dress up like babies and wear adult diapers. This protest resulted in the participants going viral, exposing them to internet ridicule to the point that they got their own Twitter moment. And, it goes without saying, but they did not get their desired conversation about safe spaces on college campuses. There are some very dangerous aspects to TPUSA despite their largely meme-based pursuits. Since 2016, the organization maintained a “Professor Watchlist,” which is aimed at keeping tabs on instructors they deem too liberal. Often, being placed on the watch list means these teachers can be targeted for harassment. Take the case of University of Illinois Urbana-Champaign professor Tariq Khan’s encounter with TPUSA member Joel Valdez. Khan had just finished speaking at an anti-Trump rally when Valdez made threatening comments about his children. Khan knew Valdez had a history of antagonizing professors on campus, but confronted Valdez. Valdez predictably recorded the encounter, exaggerated it, which then allowed it to take on a life of its own on the conservative blogosphere. As a result, Khan has been placed on academic probation, which, of course, was goal of Valdez and his compatriots all along. Similar tactics have been used against several professors across the country. This McCarthyite initiative, however despicable, may be the only one that TPUSA has undertaken that can be called a success. This story also proves that TPUSA being stupid doesn’t mean they can’t also be dangerous. Though much of TPUSA’s message is about the value of free speech and the problem with safe spaces, that hasn’t stopped the group from trying to tattle to people’s bosses and act outrageously aggrieved when they are made fun of online. Jesse Farrar (@bronzehammer) is a writer, podcaster, and co-host of the Go Off Kings Twitch stream. Anyone who knows his work knows that when he tweets he is usually joking. When he tweeted that all conservative students should be dunked under water until they drown, anyone who gave it a second thought should have known he was joking. Charlie Kirk, however, did not. Following the tweet where Farrar joked about drowning conservative students, Kirk and others at TPUSA took him at face value. In what were obviously bad faith tactics, conservative trolls got Farrar temporarily banned from Twitter, and attempted, in concert with conservative outlets like Independent Journal Review, to get him fired from his job. They quickly learned that Farrar is a freelancer. The campaign had no impact of Farrar’s career; in fact, it gave him more notoriety. It did earn Charlie Kirk a spot on Fox and Friends. While on Fox and Friends, Kirk said, “I hate playing the victim, but this is beyond the pale,” without a hint of irony. Of course, the goal here was really to raise TPUSA’s profile generally, and Kirk’s in particular. In that sense, the choreographed outrage was successful. One of the favorite pastimes of TPUSA is developing harebrained schemes to expose liberal bias on campus. Kent State student and (now former) Turning Point member Leandra Lynn posted an essay, penned by fellow TPUSA member Klara McKee, on what is wrong with protesting the national anthem. Rather than demonstrate some sort of bias on the part of the professor, who offered generous constructive criticism, this demonstrated to all of Twitter that Klara is a very poor writer. Leandra and Klara have since deleted their Twitter accounts, and Leandra has stepped down from TPUSA. TPUSA probably wishes they could put Diapergate behind them, but of course, there is no way that something that good wouldn’t get at least one more day in the sun. Katilin, we may not agree on much. But, on this, we are united. Following the release of the letter, the Kent State chapter voluntarily dissolved and their Twitter account was shut down.